First, make sure you go to your blog home page. If you're not sure how to get there, simply click on "Blog", and choose your blog. You will then be at the home page of your blog. From there, you will notice a new "+customize!" button in the top-right portion of your blog. Click the customize button, and a window will pop up titled, "Cusomize Your Blog!". In that window, there are various clickable fields which will change the corresponding color. 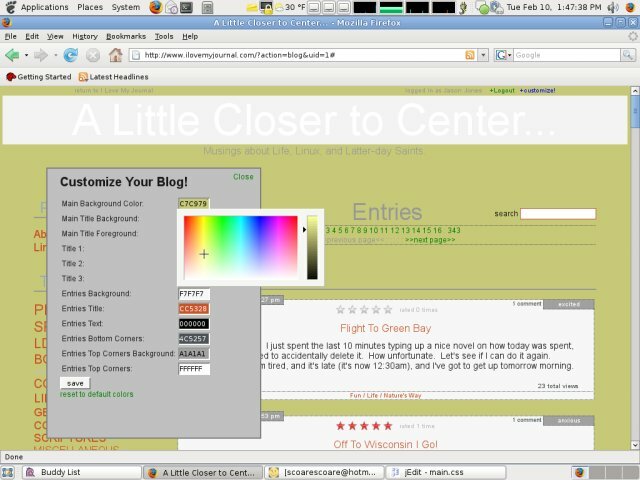 For instance, below, if you click on the "FFFFFF" which corresponds to the "Main Background Color", a color palette picker will open, allowing you to select the background color of your blog. When you click on a color, you'll notice that the color of the portion of the blog you are changing will change in real-time. Click on all of the fields to customize your whole blog. When you are done, be sure to click the "save" button, and immediately, you'll have a blog with a whole new look! Hey hon, I just read this and it makes complete sence. I haven't tried it yet. I jusst wasn't in the mood last night, but you explained it perfectly. I like the colors you choose in the example too. Well, love you sweet stuff. I just read ur tut and it made perfect sence. I'm trying it now!